Kitchen Cabinets and Granite Countertops, Pompano Beach FL > Blog > Blog > Custom Cabinets – The Best Option? Custom Cabinets – The Best Option? Why Should You Choose Custom Cabinets? There are a number of benefits to choosing custom cabinets over stock or semi-custom cabinetry when designing your new or remolded kitchen. Most notable are the endless options that you have in material, style, design and finish. This means that you are able to choose the exact look of your new kitchen without any restraints in regard to cabinet size or design. Your new kitchen’s cabinets will be completely unique to you and your home. In addition, you will be able to optimize the space of your kitchen by designing cabinets that are efficient and functional, as well as beautiful. So goodbye kitchen clutter! Although they are an investment, the kitchen is the center of the home and custom cabinets will give your kitchen the look, feel and organization you need for years to come. Stock kitchen cabinets are pre-made and the most commonly used type of kitchen cabinet, most likely due to their inexpensive price and one-kitchen-fits-all appeal. They come in set sizes that can be limiting if you want to optimize the space you have in your kitchen. They can be affordable and delivery is generally very quick. But, when buying stock cabinets, you have very limited options. The size of the cabinets you can choose, their color, finish and design are not changeable. Additionally, the style and configuration of the sizes are set so you are unable to utilize all of the available space in your kitchen. Stock cabinets offer very little personality and often blend into the kitchen instead of standing out and making a statement. Although they are the most cost-efficient option, they often lack uniqueness and quality. When buying semi-custom cabinets you are essentially buying pre-made stock cabinets with custom details. This offers more options including a wider range of sizes to utilize your space and well as different woods and finishes to choose from. You can also order different design details including door and drawer choices as well as hardware. 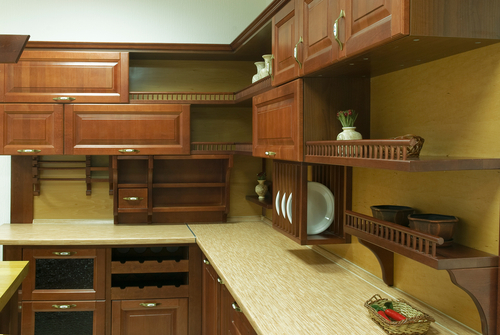 Semi-custom cabinets offer more choices than stock cabinets without the apparent custom cabinet investment. But beware! All of those little add-ons can add up. By changing a finish or choosing a different door option, the costs can escalate. In the end, you may find yourself paying the same as you would for custom cabinets but without all of the design freedom that custom cabinets can give you. Semi-custom cabinets lack the true design elements that custom cabinets offer, as well as the detail work, uniqueness and craftsmanship. Although custom cabinets can be a major investment, costing on average between $500 to $1,200 per linear foot, the options are limitless. If you are working with a professional contractor you are sure to get exactly the look and feel you want for your new kitchen. You can choose the material, design and finish of your cabinets as well as their size and other specifications including internal design elements for organizing drawers and cabinets. Whether you choose pine for a country kitchen feel or cherry for its warm red tones, your choice of wood can be a design element in and of itself. Learn More About Wood Choices! There are also a number of unique storage options available including pull-outs, swing-outs, cutlery drawers, open dish displays, spice drawer inserts, spring out shelves and ‘garage’ storage for appliances to keep counters clean and clutter free. Although kitchen clutter may seem overwhelming at times, you are not alone! There are answers to your problems, and optimizing space is one way to combat them. Additional Options. What can truly make your custom kitchen beautiful are the decorative enhancements such as custom carving and molding, finials, columns and posts, as well as legs and feet. If your contractor isn’t local, building and installing your custom cabinets can take some time. So be aware of your project’s timing and your own expectations for when you’d like to have it done. If you work closely with your contractor, your design options will be limitless and your cabinets will have a construction far superior to stock or semi-custom cabinets. The storage will be more efficient and the cabinets will offer a better use of space all around the kitchen. The cabinet design will be completely unique to you and your home. Custom work supports local businesses, offers the opportunity to use recycled materials, and locals sometimes work faster than ordering stock or semi-stock cabinets. The cabinets can be built locally or manufactured, or created on site allowing for the opportunity to resolve issue during the process of construction and installation. Although they may come with a hefty price tag, when investing in a new kitchen for your home choosing custom cabinets will give you all of the design elements you prefer as well as the optimal storage and organization that you need. A kitchen, whether it is new or remodeled, should last up to 15 years. Make sure that the cabinets you are surrounded by every day are the ones you truly love.